Manheim, PA - B.R. Kreider & Son, Inc., an excavating, paving and site management company based in Manheim, PA, recently received three individual awards from the Associated Builders & Contractors Keystone Chapter during the organization’s 2018 Excellence in Construction Awards ceremony. B.R. Kreider & Son was awarded the Excellence in Construction Award in the “Sitework over $250,000” category for The Shoppes at Belmont in Lancaster, PA for its rapid schedule delivery and extensive infrastructure improvements, as well as the Excellence in Construction Award in the “Miscellaneous/Special Projects” category for their very complex and detailed work on the Main Entrance Fountain Garden at Longwood Gardens in Kennett Square, PA. In addition, B.R. Kreider & Son received an Excellence in Construction Merit Award in the “Sitework over $250,000” category for Lime Spring Square, a 126,000 square foot commercial property located in Rohrerstown, PA.
B.R. Kreider & Son was also a key member of all four of the “Commercial” projects that were recognized as achieving Excellence in Construction Awards. B.R. Kreider & Son was part of the Wohlsen Construction Company team recognized for (“Commercial under $2 Million”) for the U-GRO Learning Center in Rohrerstown, PA, (“Commercial $2 - $10 Million”) for the Tru Hotel in Lancaster and (“Commercial $10 - $25 Million”) for Lime Spring Square in Rohrerstown, PA.
Also recognized in the (“Commercial $2 - $10 Million”) category as an Excellence Award winner was Warfel Construction Company for the Aerzen USA Headquarters Expansion in Coatesville, PA, a project on which B.R. Kreider & Son worked as part of the Warfel Construction team. The B.R. 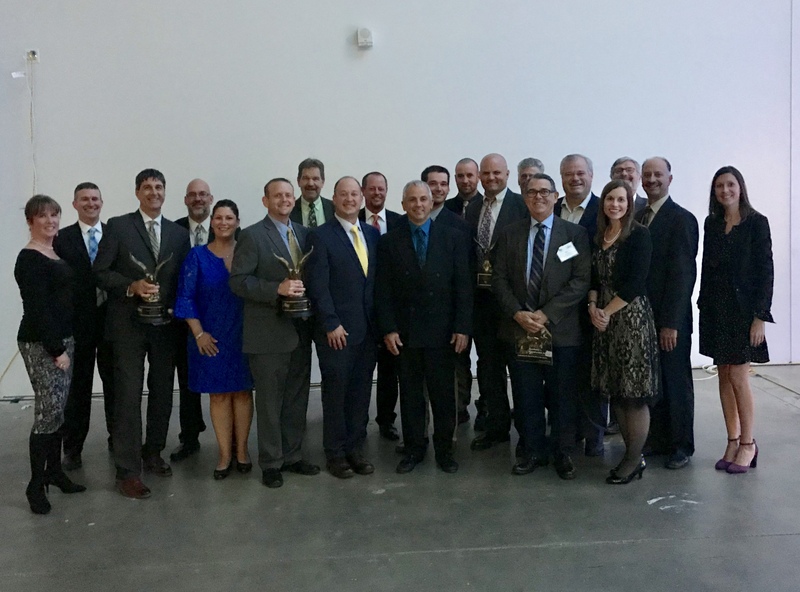 Kreider & Son team earned three Excellence in Construction Awards at the 2018 Associated Builders & Contractors Keystone Chapter ceremony.